Greetings everyone, this podcast recorded while in Savannah, GA. I’d like to share an article I wrote that was published in BIC Magazine. The published article can either be found on the magazine’s website or under Insights at www.ProActSafety.com. Strategy is a framework of choices the organization makes to determine how to capture and deliver value. Strategy, therefore, is how do we win? How confident are you about your strategy to achieve and sustain safety excellence? STEPS is a universal process for identifying, prioritizing, and solving safety problems at the organizational, behavioral, conditional, or cultural levels. Using one process for addressing all safety issues eliminates the need for continuously bringing in new consultants, programs, and approaches that create the "flavor of the month" mentality. ProAct Safety® recently compiled data on over 1,100 sites that requested our help in improving safety. The commonalities of these sites' issues has led to a new approach to solving safety problems and permanently implementing continuous improvement. The approach includes organizational structure, problem identification, issue prioritization, action plan development, improvement metrics, and a motivational and marketing strategy to ensure sustainability. 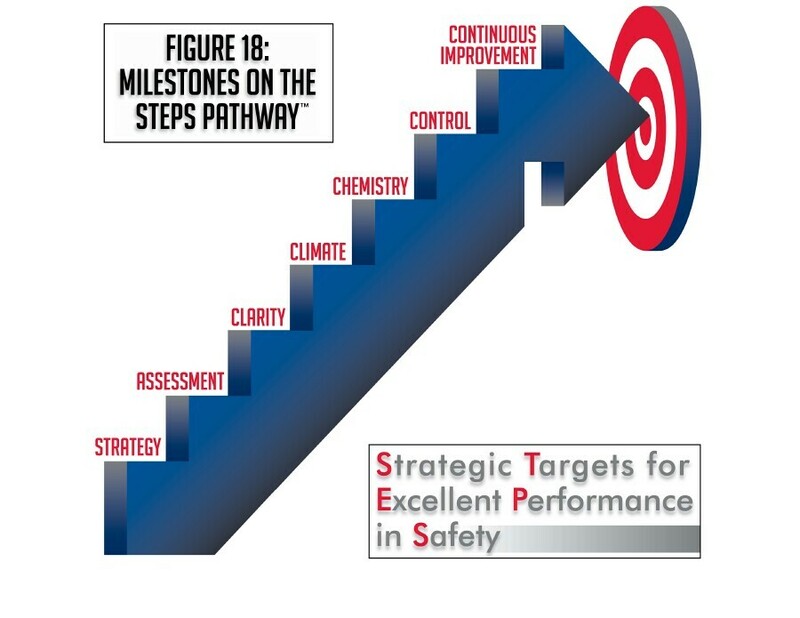 The process is called STEPS (Strategic Targets for Excellent Performance in SafetySM). Forget the old ways of measuring safety culture maturity. There is a new, more effective way to measure cultural maturity and it starts with looking at the chemistry. 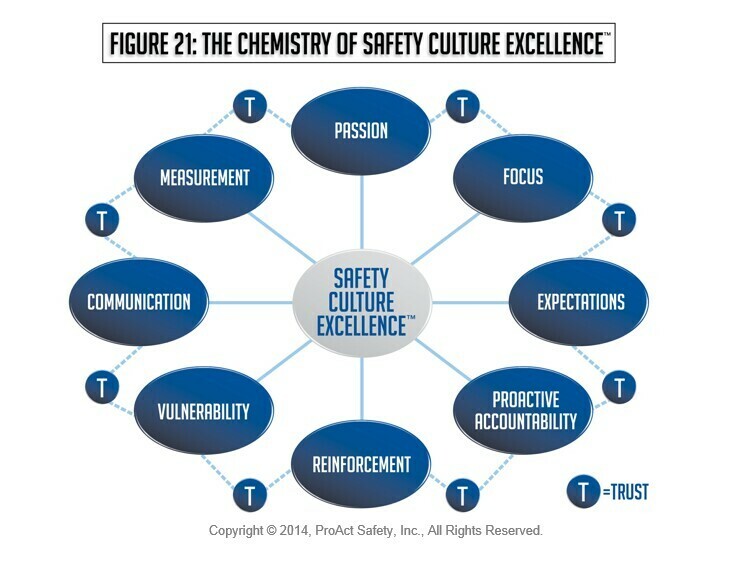 In consulting globally with many of the best in safety performance and culture, nine elements (see the picture with this post) have been identified as most important foci to establish the chemistry which facilitates the necessary climate for a culture of safety excellence to grow. Through consulting engagements and workshops, these nine elements have been successfully leveraged and measured to help organizations identify both their starting point baseline, and also to strategically prioritize which elements to focus on to advance the capabilities of their safety culture. 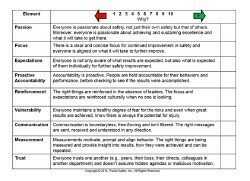 A simple exercise to facilitate answering these questions is to lead a group discussion on these nine elements to measure your current cultural maturity around safety. Putting this into practice, every workshop has resulted in very insightful conversations that identify the precise actions that need to be taken to enhance the existing culture of safety. To lead this discussion, a conversation framework is needed, thus the purpose of this article. If you have read my work, participated in any of my workshops or keynote presentations or worked with me directly, you will know I work hard to always provide more take-away tools than motivational fluff. If I was able to provide the framework to facilitate the internal dialogue in article format, I would. To assist you on your journey to safety excellence, I would like to share this tool with you. To obtain a copy for your internal use, send an email to info@proactsafety.com with the subject of Please Send Chemistry of SCE and our staff will respond at our earliest opportunity. Cultures will always influence the beliefs and behaviors of employees and contractors as they join the group. You can either manage the chemistry, climate and culture, or the results in any area of operational performance will be managed by them. I invite you to start the conversation to strategically enhance the safety aspect of your company culture and measure your progress by contributed value, not just the lowering of injury rates. Shawn M. Galloway is the President and COO of ProAct Safety. 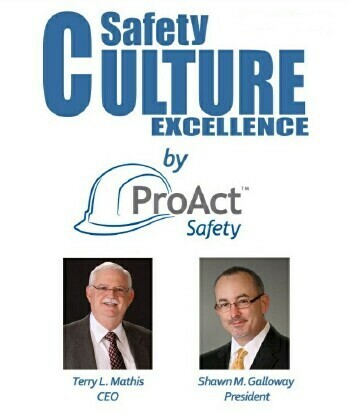 He writes (and tweets:@safetyculture) about his work helping organizations in all industries to achieve and sustain excellence in their culture and performance. He resides near Houston, Texas with his wife and three children. Based on the recent book, STEPS to Safety Culture Excellence, the authors will lead this workshop and provide a detailed roadmap on how to develop a three to five year safety excellence business plan. This two-day workshop is limited to ten participants. It would be helpful if each attendee read the book prior to the event to escalate the discovery process. Greetings everyone, this podcast recorded while in my home in Texas. I’d like to share an article I wrote that was published March 2014 in Occupational Health and Safety Magazine. The published article can either be found on the magazine’s website or under Insights at www.ProActSafety.com. Safety Culture: So Much Controversy! It created a lot of buzz, which increased significantly when I posted it recently to the groups I belong to in LinkedIn. There is a word limit in the group comments, so to reply to some great feedback and discussion, I’ve organized my thoughts here. Do I think we should stop creating safety culture? Yes. Safety Culture, or what we call it at least, already exists, good, bad, or indifferent. You only create the culture when you are first gathering people together from different backgrounds (e.g., experiences, employers, communities) and start aligning them to accomplish something. Only then (when the business opens the doors) are you focusing on the creation of a culture. Even that statement could be disagreed with, in that cultural influences were already imposed on people. Perhaps creation starts in the home? Perhaps culture of safety starts with the responsibility of the parents as their children enter the working world – that could be an interesting discussion! The business culture is created after people have grown accustom to working together. Could the safety/production/quality/leadership elements be better? Sure, always. If someone thinks otherwise, they are breathing their own exhaust. The only way we advance is to believe there will always be a better way. I have yet to find a company that only and only improvement in “safety culture” would only benefit safety. (Safety culture: Just a term used to provide understanding and structure to, A. Bring focus and B. Provide bookends to manage within.) If there are opportunities for the aspects, characterizes and capabilities that shape safety to be improved, there are always opportunities for these to enhance all aspects of business performance. What of multiple or subculture? I do believe there will be subcultures within cultures in mid to large size organizations and very disorganized smaller firms. I also believe that that a bit of autonomy is healthy, as long as it contributes to organizational vision and goals. However, I do not agree with the benefit of multiple safety cultures, unless the company-dictated safety culture is ineffective. I’d have to do research, there was a study I read about 5-7 years ago, that said every time you speak to your direct supervisor, your blood pressure increases. Now, how does that create alignment in all aspects of culture if there are medical reactions when an individual speaks with different levels of the business? What I do think is counterproductive is to completely discount the term and how it is used as commonplace in today’s business. I hear and see people saying that it shouldn’t be used. In my opinion, these people are out of touch with today’s senior executive. Telling them they are wrong, will turn them off to a new way of thinking. Of course it will take new information and experiences to help those who own the overall culture to see the realities of safety culture. But, just nay-saying without a comprehensive alternative is just spreading pointless negativity. For example, there were several in the safety field (whom are Psychologists) that several years back, strongly discouraged and disliked the use of the term habit; It wasn’t scientific enough! Habit is a common term that provides great understanding and helps serve as a vehicle for important messages about safety. 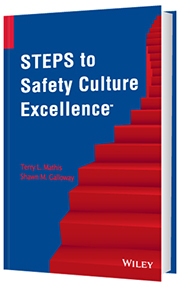 Terry Mathis and I took a well, thought-out risk with our book published earlier this year by WILEY, when using the term Safety Culture in the title. The book is more about company culture and how to strengthen it overall (to improve safety), but we realize that if we want to influence those responsible for it (business execs), we have to provide it in a manner that might appeal to those that are serious about improving safety performance and culture. Keep in mind, it was not a self-published book so the goal was not to become a best-seller for profit. We were honored when it did on Amazon, and the best feedback we received from execs was they saw how it could be used in all aspects of business culture. – Exactly our goal: provide ideas for internally-led improvement. Greetings everyone, this podcast recorded while in Orange, Texas. I’d like to share an article I wrote, published June 2013 in ISHN Magazine. It was titled, You Need to Manage Strategically. The published article can either be found on the magazine’s website or under Insights at www.ProActSafety.com. Greetings everyone, this podcast recorded while in Bismarck, North Dakota. I’d like to share an article I wrote that was published March 2013 in Occupational Health and Safety Magazine. It was titled, Stop Trying To Create A Safety Culture. The published article can either be found on the magazine’s website or under Insights at www.ProActSafety.com. Health, Safety, and Environmental (HSE) professionals face an increasing challenge, one that intensifies with each new hypercompetitive priority. It is little wonder why organizations strive to move safety from a priority to a value. To create these shared values within an organization, they must be reinforced at or near the point of decision. In principle, this always holds true. In practice, accomplishing this grows increasing difficult. Simply stating that safety is a value at an increasing frequency and passion does not make it so. The successful HSE leader of tomorrow cannot simply work towards value creation; they must become a transformational leader.